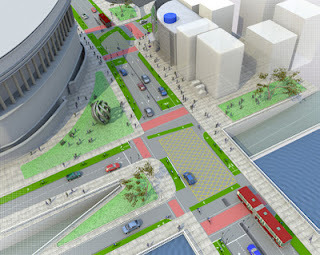 London Cycling Campaign has produced fantastic images and animations showing how the junction at the northside of Blackfriars Bridge can be dramatically improved for pedestrians and cyclists. If you cycle in London (or want to but daren't) you absolutely should check these out. Please join the Blackfriars Bridge flashride this Wednesday to push the Mayor and TfL into action. The ride meets at 5.45pm by Doggett's pub on the southside.